As far as dream jobs go, it can't get much better than getting paid to play video games. Usually gamers are the ones doing the paying, right? While Sony isn't exactly looking to hire you right now, they are willing to put their money where their mouth is. With the PlayStation Store PLAY 2014 event, the more gaming you do, the more money you'll save. From now through August 26, SEN is releasing four new digital-only games to keep your summer interesting. 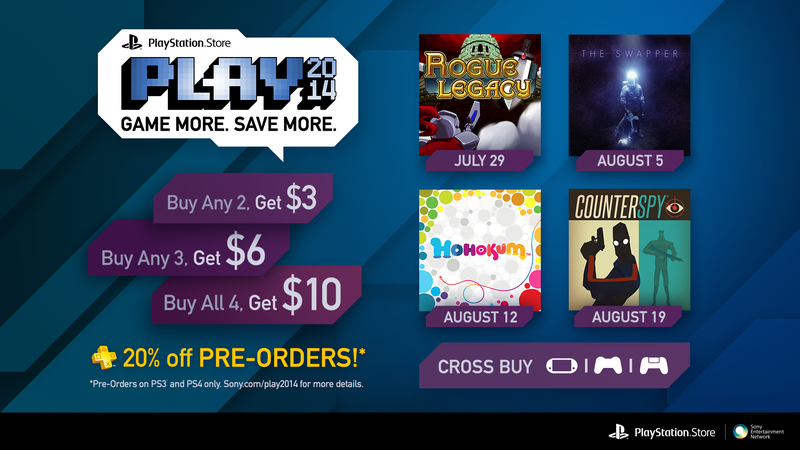 Get ready for Rogue Legacy (available 7/29), The Swapper (available 8/5), Hohokum (available 8/12), and Counterspy (available August 19), all available for digital download on the PS4, PS3, and PS Vita. The best part? When you play more games, you get more money back. While you PlayStation Plus members can save an additional 20% off any pre-orders, everyone can take advantage of the cross-buy potential here. No matter what system you download any of these games on, you can download them on the other two platforms without paying a dime. That's like getting three versions of a game for just one price. Who says it's a tough job market out there? Certainly not Sony. Why, you're practically printing money at home just by putting your fingers to work.